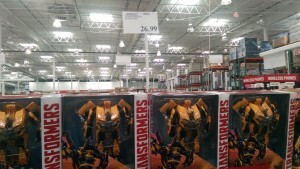 We've given you the Seibertron.com gallery of Age of Extinction Leader Bumblebee (a redeco of the DOTM figure), and it appears this figure is actually at retail, though only in Costco so far. This particular sighting comes from fellow member reluctantyouth, and a Costco in East Peoria, Illinois, priced at $26.99. If you come across this, or other figures we haven't reported on yet, drop us a line with pictures at sightings@seibertron.com, and remember to use the Sightings page and forums to help out fellow fans! Oh WOW! I can't WAIT to get yet another Bumblebee figure! I predict a LONG life on the shelf for these things. We keep saying "long shelf life" and "won't sell" - but we've been saying this since 2007. After even 2 years, you'd think if this wasn't a successful strategy that Hasbro would simply have ditched it. Clearly its earning a profit somewhere, and a healthy one - because they're still doing it 7 years later. Either that or they just think it's cheaper/easier to use pre-existing molds for him. Or perhaps, these are just all the DOTM ones that failed to sell, repackaged, and ditched the mtech weapon...? Maybe hasbro figured it was better to just eat the cost of the mechtech weapons and use this old figure than it was to make 'new' ones.... A sign that even they've given up trying to improve this thing. Shockwave7 wrote: Either that or they just think it's cheaper/easier to use pre-existing molds for him. Or perhaps, these are just all the DOTM ones that failed to sell, repackaged, and ditched the mtech weapon...? Maybe hasbro figured it was better to just eat the cost of the mechtech weapons and use this old figure than it was to make 'new' ones.... A sign that even they've given up trying to improve this thing. They're slight repaints, if you must know. Check the galleries for comparisons. And "repackagings" is a total misnomer. Despite the name, they're nothing more than new product runs using the exact specifications of an older toy. Hasbro does not do repackaging nor buying back stock: stores sell unsold stock to other stores for cheap. That AOE leader Bumble was such a wasted opportunity. He could have awesome with a new mould in the old Camaro style, but alas we get DOTM Bee (which IMO is a terrible figure anyway) with less paint and minus his electrics for £35. Seibertron member Bounti76 has sent us an image of a couple new Age of Extinction Titans figures found in a Kmart in Woods Cross, Utah. These Titans are Kmart exclusives and feature electronic sound effects and voices. They are retailing for $19.99. If you have your own new sighting, you can submit your news via the Submit News link or email them to sightings@seibertron.com. Saw Prime almost a month ago, but hadn't realized it was news! What does Grimlock say?? Please tell me it's a G1 voice chip. I'll throw my money at it! I saw these the other day. Optimus Prime has Peter Cullen's voice and Grimlock has a generic voice but I must admit, it does sound pretty good. It doesn't sound like Gregg Berger, but it sounds like a deep giant barbarian type of a voice (if that even made sense). He says things like 'Grimlock destroy! ', 'I want to munch metal' stuff like that. I hate these titan things, but I might just get Grimlock because he talks and didn't talk in the movie. They're still crummy shampoo bottles. Only now they can annoy you with screechy sounds! Those Titans are so boring and silly. I'm still trying to figure out what their purpose is. I can't understand why they exist. I realize they're for kids because they're simplistic and that's fine, but the kids that would like these are too little to see or even enjoy the films anyway. Maybe it's these that are the toys that Rick Sellers and other voice actors recorded lines for. To be sure, what phrases does the Grimlock toy say? Actually Hasbro bought back Rise of Cobra movie figures from Wal Mart that were sitting on shelves to get the chain to carry Pursuit of Cobra. That's a relief...I was worried by the pic on the TRU site whether the Classics Prime had both guns or not, since the pic showed him without the smokestacks/rifle in both modes, but the pic of the box on the shelf looks like he has it still. Has anyone gotten the set and can confirm this, though? I wanna know before I drop $50 for it. The AOE toyline is dead. It's nothing now. OptimalOptimus2 wrote: The AOE toyline is dead. It's nothing now. Darren K Nelson of the Wichita Transformers Fans Facebook group has reported that the Platinum Edition Silver Knight Optimus Prime has been spotted at a few Targets in the Wichita, KS area. This is a redeco of the first edition leader class mold that was originally exclusive to Amazon. The deco includes chromed thighs and chest. Other then the chrome I kinda like him. That being said, the only way I'm getting him is if I can find him on clearance.